Designed to take batting to a new dimension. New Gray Nicolls branding, an unprecedented edge profile and sculpted low-blade zone will make the Supernova Cricket bat the talk of any dressing room. Power, Style and absolute quality is in abundance from the game's best bat makers. Supernova is the next generation of Gray Nicolls Cricket Bats. 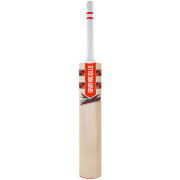 Buy the Gray Nicolls Supernova Cricket Bat now from All Rounder Cricket!